SIMPSON BAY, St. Maarten (November 8, 2013) -Warmth and sportsmanship were the two main characteristics of the recently concluded Airport Slam Games held in Aruba. The Princess Juliana International Airport (SXM) Sporting Club, which participated in the games, returned very satisfied with the organization of the event and the performance of the teams it fielded in the five sports. 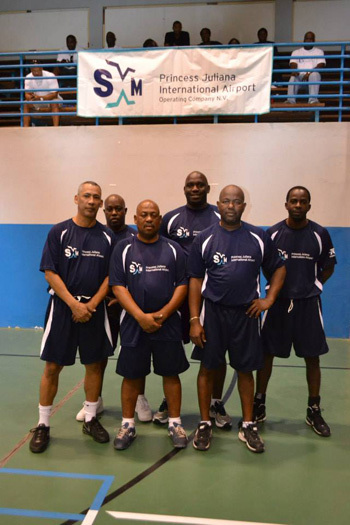 “Our teams gave a good account of themselves and made us proud, especially in volleyball and dominos in which they became sub-champs,” said Evans Marshall, president of SXM Sporting Club Foundation. He said the St. Maarten representatives took third place in softball and fourth in soccer and target shooting respectively. Other airports represented at the Slam Games were those of Suriname, Curacao and Aruba, the hosts. “The official hosts, the Reina Beatrix International Airport, gave the SXM group a rousing welcome reception and provided transportation via a party bus,” Marshall said. “At the farewell party, they thanked SXM for its branded promotional items and its successes at the games,” Marshall added. It was also announced that the next edition of the games will be hosted by Suriname in 2014. SXM Airport managing director, Regina LaBega, congratulated the contingent for “the pride and honor with which they represented St. Maarten at the Slam Games” and wished the Sporting Club more success in all of its undertakings.